Introducing the all new VIZIO 28” 2.1 sound bar system. Easily upgrade your TV with a 2-channel sound bar plus subwoofer with crystal clear sound at levels up to 95 db. Use Bluetooth to stream music from your smartphone, tablet or computer. 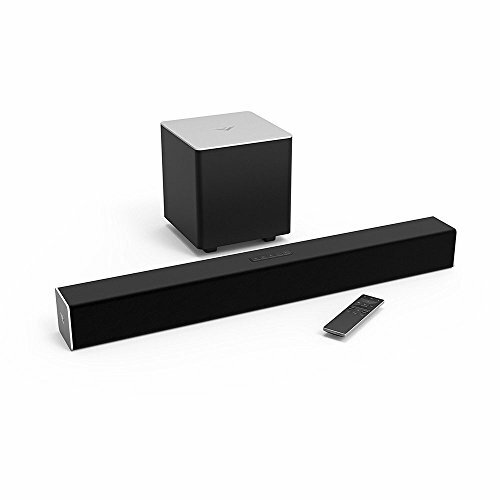 The sound bar features DTS (No Suggestions), which minimizes the distractions of fluctuating volume and DTS TruSurround for an immersive surround sound experience. With everything you need for a quick and easy setup, upgrading to an amazing home theater experience has never been easier-plug the sound bar and subwoofer in, connect to your TV, sit back and enjoy. Package Contents: sound bar subwoofer xrs321-d remote 5’ RCA to 3.5mm stereo audio cable 4’ digital optical cable (Toslink) 5’ digital coaxial cable wall mounts quick start guide 8’ sound bar Power adapter 4’ subwoofer Power cable.